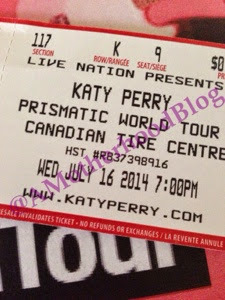 Katy Perry is in Ottawa and I'm going! Thank you @CoverGirl! I couldn't be more excited! Not only do I get to see Katy Perry in concert (AND meet her) but I also get to bring a good friend of mine! She will probably agree that we are long overdue for a girls night together! You can follow along for all the fun via social media on Twitter @AMotherhoodblog and also Instagram! I'll be using hashtags #InstaGLAM & #PrismaticWorldTour! A huge thank you goes out to @COVERGIRL for the invitation to this once-in-a-lifetime evening, one I have a feeling we won't soon forget! Posted by AME. I receive special perks being a P&GMom but I am in no way obligated to post about them. This is my way of saying Thank You. Opinions and comments on this blog are those of the author.